The 43-year-old actress Reese Witherspoon in a pink straw hat visits a nail salon in Beverly Hills. 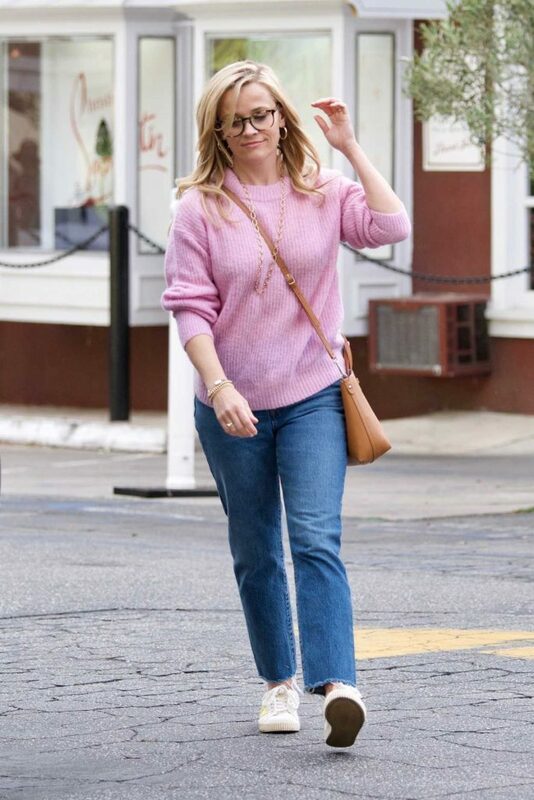 The 43-year-old actress Reese Witherspoon, whos film roles include “Hot Pursuit”, “Water for Elephants”, “Cruel Intentions”, “Sweet Home Alabama”, in a pink sweater was seen out in Brentwood. The 42-year-old “Legally Blonde” star Reese Witherspoon was seen out with her mom in Brentwood. The 42-year-old actress Reese Witherspoon in a short plaid skirt was seen out in Brentwood. The 42-year-old actress Reese Witherspoon, who starred with Vince Vaughn in the 2007 film “Four Christmases”, in a short blue denim dress out for dinner at Gjelina in Venice. The 42-year-old actress Reese Witherspoon in a black hat was seen out in LA. The 42-year-old actress Reese Witherspoon, whos film roles include “Hot Pursuit”, “Water for Elephants”, “Cruel Intentions”, “Sweet Home Alabama”, attends LA Dance Project Gala in Los Angeles. The 42-year-old actress Reese Witherspoon in a pink Adidas sneakers arrives at a soccer game in Los Angeles. The 42-year-old actress Reese Witherspoon, who starred with Vince Vaughn in the 2007 film “Four Christmases”, in a plaid shirt goes shopping in Los Angeles.